There were four of us. Two old men in their sixties. Two men much younger. We wanted an adventure. We wanted stories to tell. We were tough. We were arrogant. We still think we are tough, perhaps more so now, but now we have more respect for risk and danger. We will not again invite it so cavalierly, at least not anytime soon. My older brother is a seasoned outdoorsman. A former Marine, former Border Patrol Officer, and retired from the Marshall's service. While not the military and law enforcement type like my brother, I've been down a river and through the woods a time or two myself. The young men, my brother's sons, had less experience, but the advantages of youth. 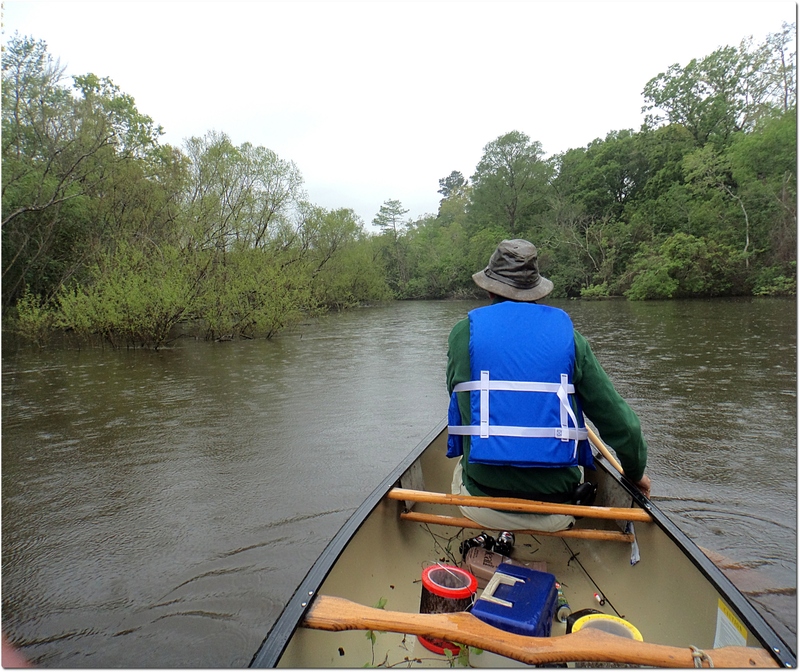 The Ochlockonee River put all of us to the test . . . and, truth be told, got the best of us all, at least for a day. 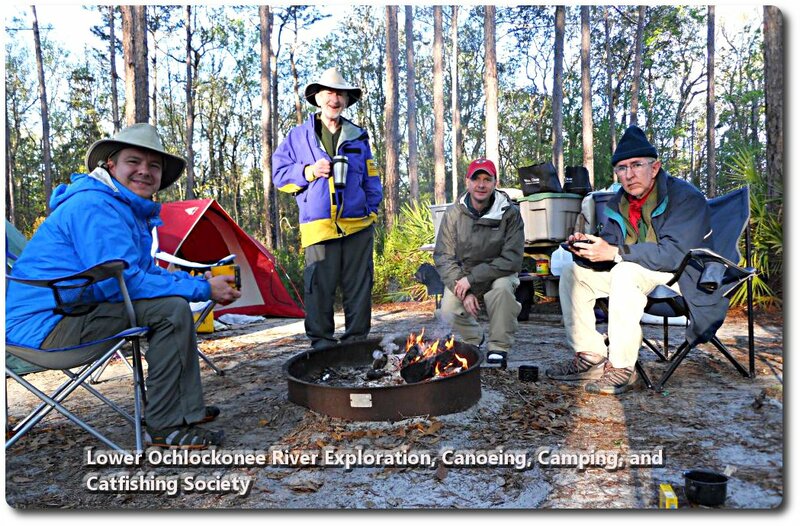 The planning, begun in January 2013, (before the heavy rains and Florida Panhandle river floodings of February 2013), was to start the adventure at the Lake Talquin Dam and paddle down as far as we could go in four days, camping on the sand bars for which the Ochlockonee is known each night, wherever we decided to stop. The floods were so bad, however, that Ed and Bernice's Fish Camp, just below the dam, was closed for two weeks during March. 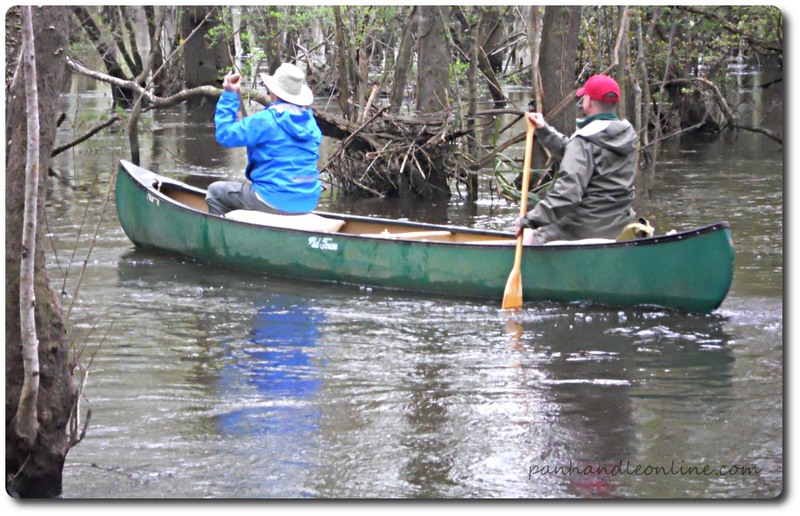 Three weeks before the week planned for our trip, the scheduled Paddle Florida's 'Dam to the Bay' annual paddle down the Ochlockonee completed without problems, we were informed (except for some high winds and rough waters near the bay). That was encouraging. We did not want to modify our original plans, but we still worried it might be necessary, despite Paddle Florida's success. An integral part of our planned adventure was to go without GPS, but this was amended, at my urging, to have at least one per boat available in case of emergency. I got to say, “I told you so”. 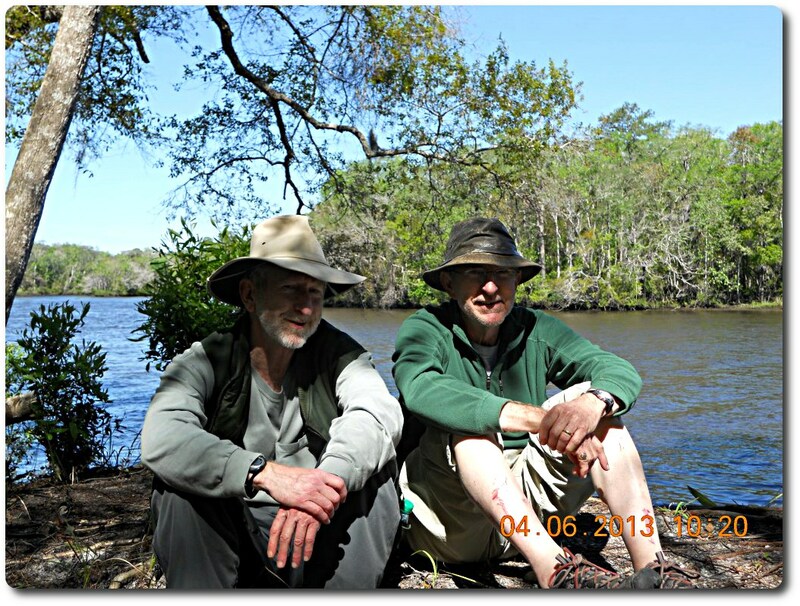 We arrived at the river, near the dam, on Tuesday, April 2, 2013, to look with our own eyes and make a final decision. We saw two gates open and much water coming through. The weather forecast for the week was heavy rains every day, with possible dangerous storms on Wednesday or Thursday, depending on whatever weather factors control the timing of such things. One of the young men lobbied to keep our original plans. He was overruled. It was late afternoon when we got to the river, so we modified our plans to go find a primitive camp site down river from the dam and make our decisions the next morning. After looking at a couple of others, we settled on Revell Landing, about twenty miles south of the Dam as the birds fly, and made our camp. Our cell phones had no signal at Revell Landing. The only map we had was a small paddle guide. Our plan was to navigate like our ancestors had done, but we did allow ourselves the luxury of compasses, again in case of emergency. Wednesday morning broke clear. The weather did not look threatening at sunrise. The eager young man among us insisted on going upstream as far as possible to launch. He talked his brother, the other young man, into going with him. As we had only one vehicle with us, I offered to transport the other three upstream, if they insisted on going, and bring the truck back to the landing to wait for them. I was concerned with how high the waters were and how often they ran out into the flats in every direction. I was also concerned with the last weather report I had seen the day before. My brother, the other old man, choose also to stay at the landing. Wisdom comes with age, apparently. Although they wanted to go farther up, my brother drove his sons only up to Whitehead Landing to launch, asking them to stop when they got back to Revell Landing so that we could all re-access the rest of the day. My brother's observations of the river concerned him, though, and by time he got back to Revell, he proposed that he and I paddle upstream to meet them. I agreed that paddling upstream a couple of miles and joining up with the young men would be fun and seemed harmless enough. We should be back before the bad weather came. Plus, I looked forward to the paddling and the exercise. The river was so high that the little backwater on which Revell Landing is located looked like the main channel. We decided to paddle straight up it, to avoid the heavier currents and gain the shortcut. It had already begun to rain when we came to the end of the backwater, the trees thickening and it being a challenge to find our way through. We turned toward the morning sun and worked our way through the flats until we soon hit the main channel of the river. Thinking we had made good time, we paddled across to the east bank, my brother fishing a bit while we waited for the young men to paddle around the bend so we could surprise them. After an hour's fishing, however, they had not shown. The rain being light, we were not concerned and decided that they must have made good time and passed before we got there. The current was fast and they could have easily made good time. The fish were not biting, so we set out down the main channel expecting to meet up with them at our campsite. Way too much time passed and we had not seen our campsite. Although the rain was getting harder, we could still see well enough - we just had not seen the landing. We had all discussed, earlier that morning, that someone should mark the landing on the main channel; but, as it turned out, each one had thought the other would do so . . . and no one had. As time continued to pass, we became certain we had indeed missed our landing and decided to look for another. 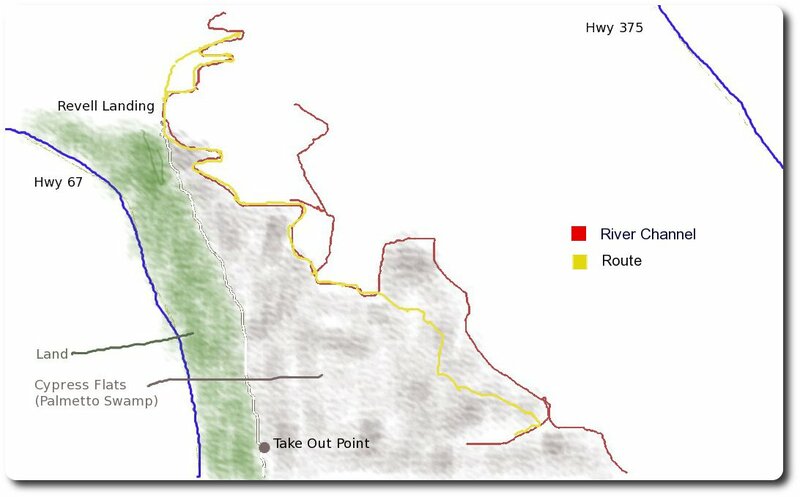 Plus, the farther south you go on the river, the more likely you are to have a cell phone signal – which was now becoming important to us after all. When we reached a point where the river turned due north, we keep going southwest, believing we would run into the river again and save some time. The flats here were not that bad as the water was high. My brother and I made our big mistake, however, when hitting a westerly diversion from the main channel and thinking we had returned to the river. We had tried to follow the strongest currents to stay on the main channel earlier and this was the strongest current we had seen all day. We still were not using GPS. We were still quite arrogant. Although we had some concern for the younger men, not being in timely contact with them, we were gearing up for an adventure after all. When we turned west into what we thought was the river, we got one. This channel, despite its strong current, took us deep into the cypress flats and abandoned us there, its waters spreading out over the cypress knees and palmettos in all directions as far as you could see. 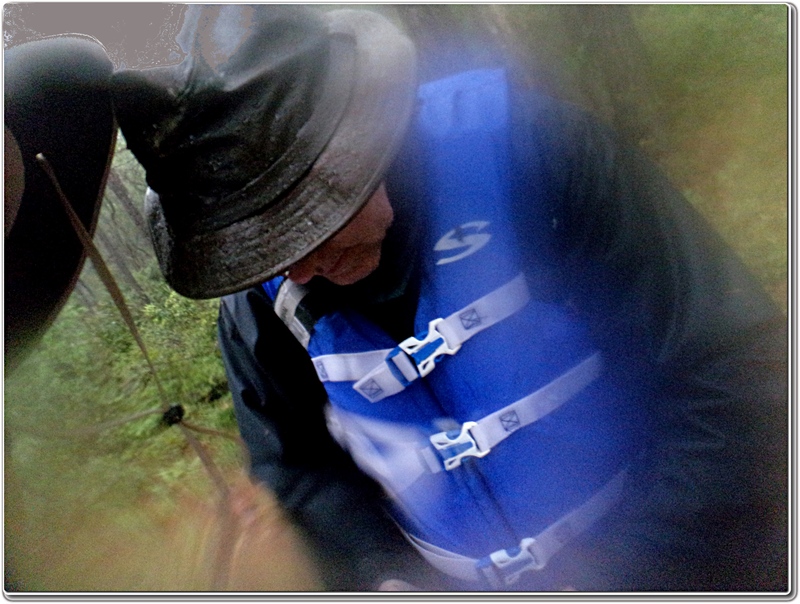 Our speed slowed tremendously while navigating the narrow passages between the trees. Often, we would go for quite a distance only to reach an impasse, having to back out and try another route in the maze, at times just getting stuck again. Our first plan was to go north in hopes of finding the real river. When going north led nowhere that looked promising, we decided to go back south and look for the river there again. We knew we had not passed another landing up river and were getting ready to find a place to get out. When that did not prove promising, and with the rain getting heavier and daylight becoming a finite commodity, we decided to head west. As the day got darker, the compass came out without a thought to any earlier dedication to primitive navigation we might have entertained. My brother was now reasoning that if he and I, who had a life-time of experience on the Ochlockonee, had missed our landing, certainly his boys had missed it. If he and I, old seasoned and tested outdoorsmen, could not even stay on the river, certainly his boys could not either. He began to worry – not about us, but about them. I assured him that they were young, strong, intelligent, logical, and proficient with technology. By all accounts, I reasoned to him, they were fairing far better than we two old, white-haired fools were fairing. And, although they were not without a scary adventure of their own, they were. The young men had indeed missed the landing also, but had managed to stay in the main channel and paddle on down several miles, getting their day on the river as desired. They were worried about us. They were far enough down to have a cell phone signal and had sent texts. They were not surprised that we had not answered their texts as they assumed we had no signal. But, they were surprised we had not been waiting at any of the landings they had passed. Finally, as darkness approached them, they pulled into a landing and called the Fish and Wildlife Commission with their GPS coordinates. One of the two wonderful Fish and Wildlife officers who helped us that night directed them to paddle on down to the next landing where he would be waiting to take them back to camp. 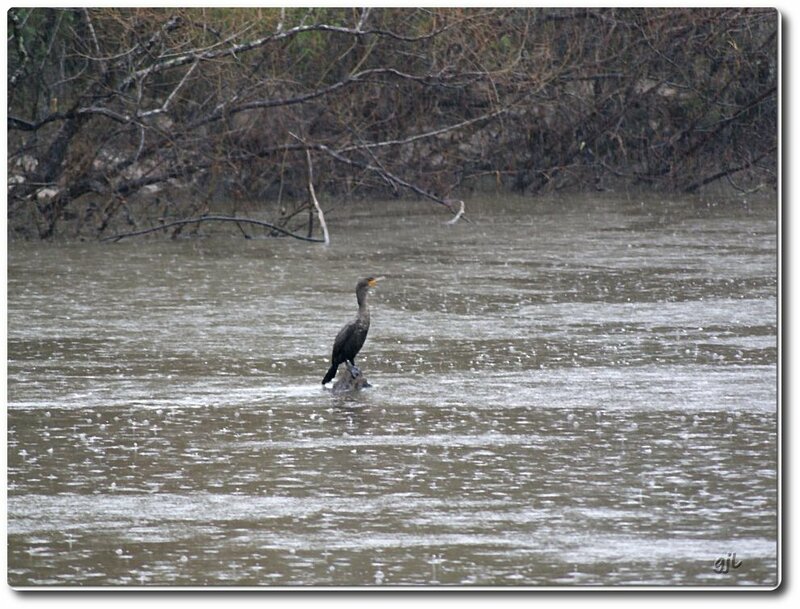 Unforeseen to the officer, though, a bit of the bad weather did hit right as they got back in the river. The young men had to fight to keep from capsizing as they paddled quite a distance on down the river in the dark. Finally, they made the landing and were out safely, although with an adrenaline blood level now that they had rarely experienced and found unpleasant. In the meantime, it is getting dark and the weather is getting bad on the two old fools back up in the flats and still no land in sight. Contingency plans are being made. 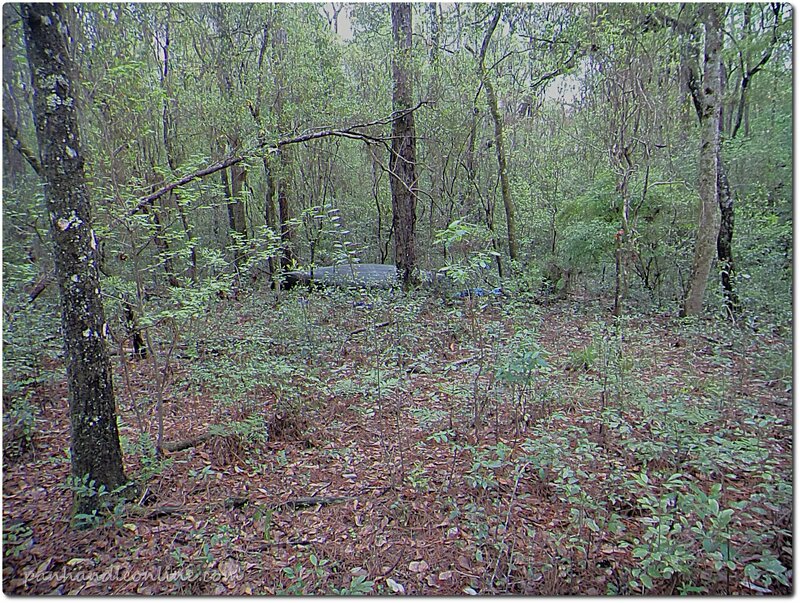 Cutting enough palmettos to make a reasonably dry bed in the swamp was one. Finding a rare spot of high ground and climbing was another. Stringing the tarp we had in the canoe from a tree limb and taking turns sleeping in it through the night was another still. Yet, still hoping to find actual land before any of those plans became necessary, despite the fog in our eyeballs and clouds of mosquitos blurring the track of our vision as each moment got darker, westward we continued. As Abraham Lincoln has been portrayed as saying, however, “A compass, I learnt when I was surveying, it'll point you True North from where you're standing, but it's got no advice about the swamps and dessert and chasm that you'll encounter along the way. If in pursuit of your destination, you plunge ahead, heedless of obstacles, and achieve nothing more than to sink in a swamp... What's the use of knowing True North?” My brother and I had learned that about True North that day. . . and True South . . . and were about to decide that the same rule applied to True West. But, we had no choice. We had already tried north and south and we were now so far west that it made no sense to turn east and go backwards at this late hour. We knew that would not work. West it was, as true as we could go, which was not very true due to cypress knees and hardwood and all manner of obstacles. All afternoon we had been going one direction in order to go another. Such is the world of cypress flats, a world we felt we would never escape. Then, just as hope was slipping away as fast as the last bit of daylight, we saw what looked like dry land. We could not truly trust our vision. There were swarming balls of flying bugs in our faces. We were so wet that water dripped incessantly into our eyes, our arms too busy paddling, pulling and pushing to wipe it away any longer. We had seen a few mirages already. Was this just another? But, instead of fading away, it became clearer. The closer we got the more assurance we had. This was indeed land. As we got close, my brother wanted to get out and pull the canoe toward it, but I insisted he stay put until I navigated the bow up against the dry soil and could get out and step on it. It was rough land, the palmettos scratching at our legs while the thistle was stinging them. All manner of spiders and bugs danced and flew around us in celebration of the feast that had arrived. We heard scurrying in the undergrowth as various critters either crawled away or slithered closer to size us up for dinner. Still we loved this land. 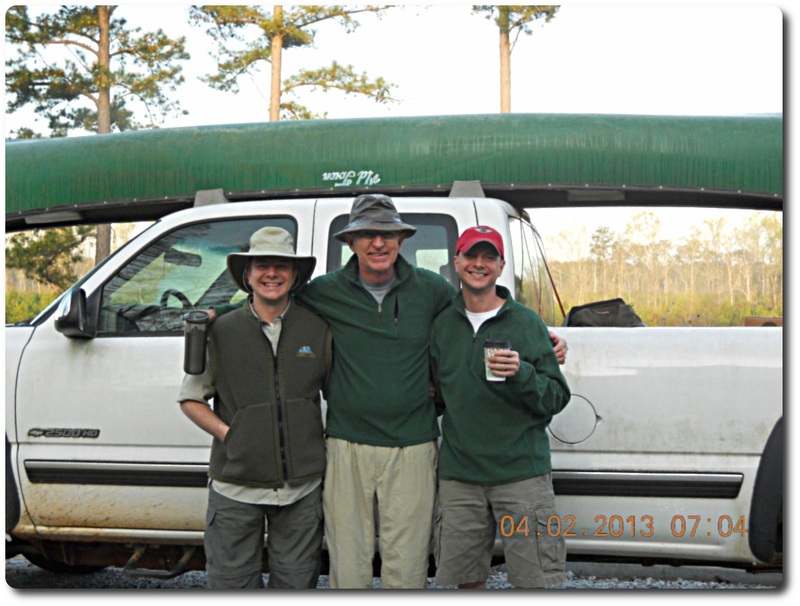 With a burst of renewed energy, we pulled our borrowed canoe up the hill and secured it. Then, while I sorted out what was left of our supplies, my brother, the one with closed toe shoes, made his way through the brush to the top of the hill. There, a few minutes later, after he was out of sight, I heard him shout back “Road!” I immediately re-examined, as one is want to do in these situations, my understanding of the universe and the role of the Deity within it. I wondered if I had made any promises in the last few hours that would now be hard to keep. It can be miles between these little forest roads and we had come out right at one. The road led on up a hill and at the top of the hill a cell phone bar appeared, if and only if, you held the phone up at head level. Our GPS, also brought out without reluctance now, was not viewable due to the fog on our glasses. So, I took a picture of my brother's phone with my water-proof camera. It was upside down, but eventually I could read it. When I pulled out my lens cloth to clean the fog from my glasses, it only deposited more water on them. Like everything on us, it was dripping wet. We could eventually see the texts from the young men and placed a call to them. They did not answer immediately, but called back in a few minutes – safe and sound, albeit a bit shaken. We spoke with Fish and Wildlife and notified them of our position. Then, with the world back in its proper order, we abandoned unnecessary weight and began to follow the two rut forest road we had found, still heading west. Within a mile we came to Highway 67, where we turned north. As there is very little traffic on this road after dark, we resolved to a long walk. We had no idea where we were at the time, but we were only about five miles or less south of our campground. As we walked up Highway 67, my thoughts turned to a book I am reading – A Soldier of the Great War – by Mark Helprin. The novel begins with an old man undertaking an all night walk. While reading the novel, it had never occurred to me that this old man might be taking an all night walk – especially while soaking wet, bone cold, and with a possible storm on the way. The tree tops were bending in the wind at this point. Fortunately, we did not have to walk long before another fantastically nice Fish and Wildlife Officer came by and picked us up. Turns out, we had only two miles left to the camp from where he found us, but for all we had known earlier while walking, it could have been fifteen or more. We slept the night at Revell with the tents leaking a bit in the hard rain. But, I slipped in the back of the truck when I heard the others snoring and stayed dry. Wisdom does come with age. The next morning we went to retrieve the abandoned canoe. 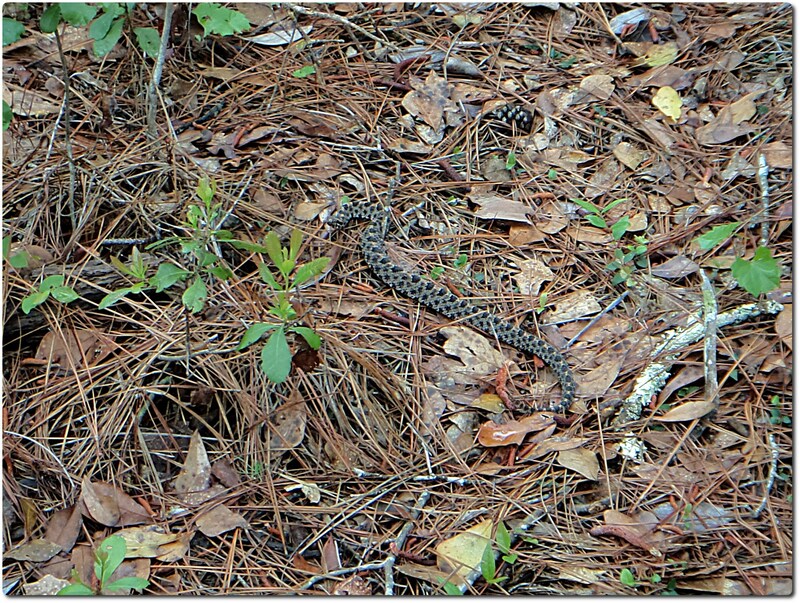 Near it, where we had considered sleeping the night before, we found a rattlesnake sunning. After retrieving the canoe, we took it easy. Broke camp and moved to Womack Creek, where there is a toilet and a hot shower and a generous host who is an excellent cook. We rested. The next day, as the weather was still bad, we stayed off the river again. Instead, we grubbed worms, went fishing, had a fish fry, had a drink or two and told tall tales of four men of great courage on the river during the storm. After all, what's the point in almost killing yourself, if you can't tell tall tales about it later? Page designed by Panhandle On-Line, Inc. Copyright © 2015 Panhandle On-Line, Inc., all rights reserved.